This greatly updated and expanded version of a 1996 classic - in its time, the first major study on the practice of international business dispute resolution - is a new book in itself. Benefitting from a comprehensive empirical survey of new trends in the field, and from discussions of the newest tools for making settlement negotiations more effective, the second edition is a "must have" resource for anyone dealing with a potential conflict in international business relationships. statements and recommendations of numerous practitioners made during personal interviews. An abundance of illustrative graphs, tables and practical checklists enhances the presentation throughout. 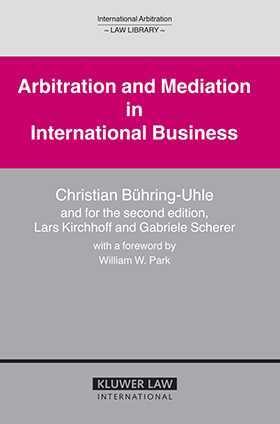 As a detailed analysis of how dispute resolution actually works in modern international business-with practical guidance on relevant techniques-this book will be of enormous value to corporate counsel and to international lawyers and business persons, as well as to scholars and students of dispute resolution.